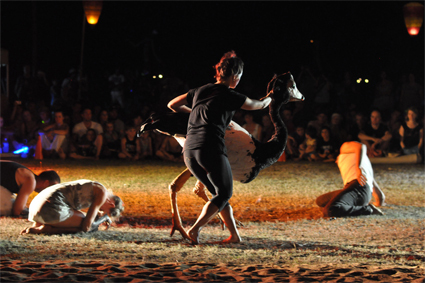 DIRECTOR AND PRODUCER ANDRISH SAINT-CLARE HAS MADE JABIRU’S MAHBILIL FESTIVAL A DISTINCTIVE CULTURAL EVENT IN THE NORTHERN TERRITORY, WITH ITS INNOVATIVE INSTALLATIONS, PERFORMANCES AND FAMILY-ORIENTED APPEAL. FOR 2011 HE’S BEEN INVITED TO BE ARTISTIC DIRECTOR OF THE FAMOUS GARMA FESTIVAL AS WELL, A QUITE DIFFERENT EVENT BUT WITH SOME IMPORTANT SHARED PRIORITIES, NOT LEAST FOR YOUNG INDIGENOUS ARTISTS. I ASKED SAINT-CLARE ABOUT HIS BACKGROUND AND HIS APPROACH TO EACH OF THE FESTIVALS. What is your background as an artist and producer? My mother collected and illustrated folk songs and tales when I was a small child and also forced me to study the cello, which I got good at. Later after the difficult years as a dislocated and deprived teenager looking for an Australian identity, I started to meet and work with artists, musicians, filmmakers and became a member of a seminal theatre group, The Performance Syndicate, led by Rex Cramphorn which was devoted to realising a new performance language that paid homage to our Asian geography. This early period involved various excursions from Khatakali to Kabuki to Martha Graham, writing for radio, learning film editing at ABC TV, composing on an Atari and tutoring for NAISDA, doing all manner of things as an arts worker and performer. Then after abandoning the arts for a decade or more I was invited back to compose for a ballet by Kim Walker about the life of Aboriginal opera singer Harold Blair. A couple of years later I decided to abandon city life and settled in the Northern Territory and spent a lot of my time in remote communities creating and devising performance works with the people there. On Elcho Island I found an opportunity to create a work about the contact history of Yolngu people from North East Arnhem Land and the so called Macassans from the island of Sulawesi in the eastern Indonesian archipelago. The resulting large-scale stage work Trepang was widely appreciated and has been written up in various books and articles. Trepang was followed up by another large live performance work for the stage called Fire Fire Burning Bright about a massacre of Aboriginal people in the Kimberleys around the closing stages of the First World War. The work was performed by Gija and Mirrawong speaking people at the Quarry for the Perth International Arts Festival and at the Arts Centre’s State Theatre for the Melbourne International Arts Festival. After this period, finding it increasingly difficult to raise funds for large stage work, I found myself more and more involved with community cultural development projects including producing festivals. Why your particular and enduring engagement with Indigenous cultures? I have a refugee background and had considerable racist experience when I first arrived in Australia as a child. This continued in lesser ways of discrimination for many years and added to this were the very distressing stories my mother related to me about the war years in eastern Europe, which included the murder of several relatives and the scattering and dispossession of my family. All this led me to have great sympathy for the lot of Aboriginal people when I finally met and made friends with some as a young adult. From these roots and the sometimes lengthy travels I undertook to places in South America, North Africa and Indonesia set me on the road to a fascination with Indigenous people and cultural studies. Of course, as one matures and illusions dissipate, it becomes untenable to apply attitudes of ‘study’ to the many Indigenous people who have become personal friends and family. How long have you been working with the Mahbilil Festival and what is its particular character and appeal? Originally I was asked to do a cultural mapping of the area around Jabiru by a mining company looking to develop small business with Bininj people in 2004, but ended up being asked to take over the Jabiru Wind Festival by Gundjeihmi Aboriginal Corporation and change it to a more Indigenous event, which I did successfully. In 2009 I was again invited back to reverse a slide in the quality and direction of the festival and again made it largely about local and regional Indigenous culture with a youth focus. Having worked on a number of regional festivals I generally look for what is unique in local characteristics and resources. Jabiru is a mining town with a mixed population of Indigenous and multicultural backgrounds so I thought it would be good to reflect this diversity, something that is rare in the remote and regional festivals of the Northern Territory. The town is also situated in the midst of a vast wetland full of birds, buffalo, barramundi and so forth, so we have instituted a magpie goose cooking competition for instance, judged by chefs from Cooinda and the Gagaju Crocodile Hotel. Magpie geese are delicious to eat and there is no place else in Australia really that you can get a taste of this bird. We also feature large earth oven cuisine where buffalo is cooked in maleluca bark and spiced with local native herbs. 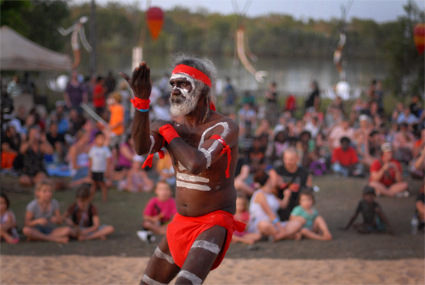 The festival site is also in a park next to a lake, so on a laid back family afternoon you can eat, shop for artefacts, watch Aboriginal artists weaving and painting and let your kids go on free water slides and dodgem cars and enter spear throwing and didgeridoo blowing competitions. Then you can marvel at the magical installations on the water in the fading sunset. This part of the festival is all about art and multimedia. The installations are based on local Indigenous mythological figures, the use of which has been approved by the local elders and are interwoven with soundscapes and, when possible, traditional dance. 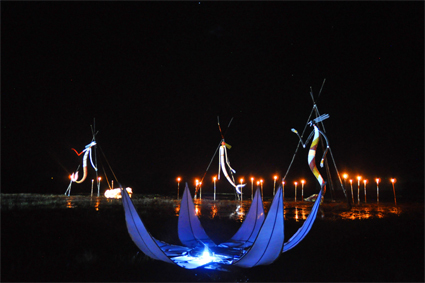 In 2009 we created large, illuminated mobile puppets mounted on boats that appeared like creatures from another world. Last year we installed five-metre tall Yawk Yawk figures, the Bininj “mermaids” on the lake. These were surrounded by gigantic lotus buds that opened to reveal illuminated balloons that floated up into the starry darkness like mermaid eggs. The final part of the festival is devoted to the concert stage. Here we have all manner of bands from Indigenous groups such as Narbalek to funk and rock from the night spots of Darwin interleaved with dance performances that have included Maori poi, Balinese, Congolese, traditional performance from Groote Eylandt, Oenpelli and hip hop. Simply put, the festival caters to family, art and entertainment with a broad, eclectic programming mostly absent from the other festivals. What do you feel you’ve achieved with Mahbilil? Mahbilil is devoted to winning hearts and minds in the town and celebrating our communality. The festival has certainly achieved this and virtually everyone living there comes out to enjoy the sights and activities. Local attendance has also increased since we discontinued alcohol being served on site. We also have an increasing number of visitors to the extent that you have to book way ahead for accommodation in the town. Beyond this, the festival is about showcasing what is going on, especially for children and youth. The Kakadu Youth Centre for example runs many after-school workshops where the young learn to make videos, train in music, songwriting, dance, gymnastics and various other arts and crafts. There are also extensive collaborations with the Jabiru Area School that tend to go into overdrive a few weeks before the festival. By now I feel that we have achieved a unique festival that is contributing cohesion and pride to the life of the town. For the first time last year we were asked to expand the festival with sporting events and we’re working on a parade, which will hopefully display floats and marching groups contributed by the organisations and businesses in the region. Garma is already well defined, not least as an ideas and issues festival. How did you come to it and what do you wish to do with it in terms of continuity and new directions, if any? There was nothing special about how I came to Garma. In early 2010 there was a change of administration at the Yothu Yindi Foundation, which runs Garma under the guidance of a Yolngu steering committee. I was asked if I wanted to direct the festival. I said no straight away, as I didn’t think I had enough time available to do the amount of work it would take and I was also uncomfortable with the idea that a non-Indigenous person should be the director, even though there had never been an Indigenous director before. I could not think of a Yolngu who had the training, experience or willingness to take it on, so I recommended Rhoda Roberts, whose Dreaming Festival I had attended a couple of times. A short while later I was rung again and asked if I could handle producing some part of the festival at least and I ended up agreeing to do the Bunggul, the traditional performance section, which was put on every afternoon. I basically accepted because I had been working with Bininj in central Arnhem Land for the past two years and this was an opportunity to get back together with my Yolngu friends and do things together. As well, Rhoda’s production team were all southerners, so they had no one else who knew the elders in the various communities to negotiate with to bring their teams to Garma. Early this year, things had moved on again and I was asked to be the artistic director, as well as carry out many of the other directorial jobs. I thought that within the steering committee’s guidelines I could perhaps try to change a few small things in the proven formula and provide a situation which might be both more supportive of local talent while being more open to presenting contemporary culture from the Yolngu communities. I was also aware from many of my younger colleagues ‘down south’ that Garma was unknown to most of their generation, yet here it is, the most significant Indigenous festival in Australia. As you say, Garma programming has been well defined for a dozen years, so it is not something which can be easily toyed with. Many important people from traditional leaders to industrialists to politicians and academics attend the key forum lectures and discussions, nor are the exhibitions and performance-oriented activities devoid of representational significance or statement of values and status. There are however gradual steps which need to be taken to keep proceedings open to voices and influences that maintain currency as well as cultural integrity. Garma is essentially an Indigenous bush festival, not a pop extravaganza. We do not strive to showcase established and well-publicised artists, but find it more valuable to present incredible talents found in the communities who may not have had the advantages of promotional opportunities found in cities. There are sweet and powerful singers as good as any in the city and these may be seen at the 2011 Garma Festival. What is more, we are negotiating a deeper and more extensive set of Bunggul or ceremonial dance performances than perhaps anywhere in Australia. Finally we have also identified some extra time in the daily regime allowing for the presentation of contemporary performances that combine traditional dance with, for instance, a contemporary band rendition of manikay or song. This is the living culture that youth are experimenting with in their communities. They get almost no government support and the commercial world is thousands of kilometres away, so Garma is one of the rare opportunities for them to reveal their work.